Wide Right! Florida State and Miami. Are they Baaaaaaaack? Wide right. Say this to the right person and you will hear stories and celebration until your ears fall off. Say this to the wrong person and you may not hear anything after your ears were knocked off. The Florida St.-Miami rivalry may be the best in-state rivalry of the last 30 years. The young kids may not understand but the old guys like my good friend Pat know what it’s like to immerse yourself into a rivalry of epic proportions. Lately, this rivalry has resembled more of a pillow fight than the traditional Convicts vs. Criminoles of years past. Florida State was a nationally irrelevant program until the mid 1970’s when Bobby Bowden was hired from West Virginia. Bowden had reached mild success with the Mountaineers winning the Peach Bowl in 1975 while compiling a record of 42-26. 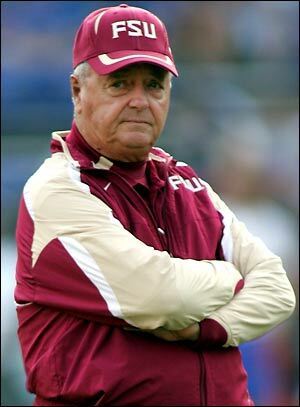 In his first 5 seasons at FSU, Bowden won 10 games or more 3 times while leading the Seminoles to 3 bowl games including 2 Orange Bowl appearances. The Seminoles were 4-29 the 3 years previous to Bowden’s hiring. Overall the ‘Noles became a program to reckon with and their “play anyone, anywhere, anytime” mentality swept the nation. Under Bowden, FSU won 2 national titles and hold a record with 14 consecutive Top 5 finishes in the AP poll. Bobby Bowden retired after the 2009 season with a career record of 377-129-4 finishing his career second all-time in wins to Joe Paterno, who still coaches at Penn State. The Miami Hurricanes were the “bad boys” of college football in the 1980’s. Like Florida State, the ‘Canes were an afterthought in the mid-70’s with a record of 36-60 over a 9 year span under 5 coaches before Miami hired Howard Schnellenberger. After debuting at 5-6, under coach Howard the ‘Canes went 36-10 the next 4 years including 2 Bowl wins and the 1983 National Championship. Schnellenberger left after 1983 and was replaced by Jimmy Johnson. 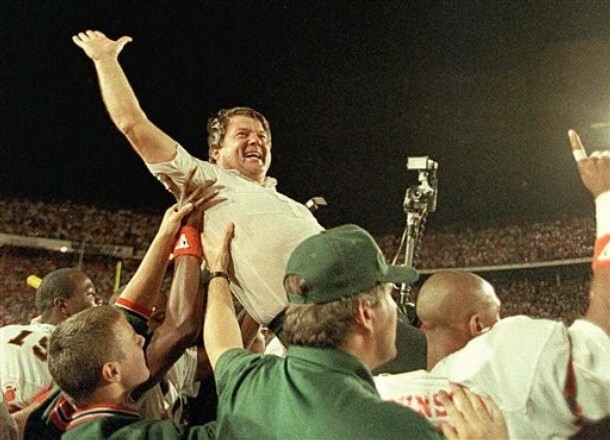 Under Johnson, Miami continued to roll with another National Championship and a 52-9 record. Things were good in Miami although they still had a hard time selling out games. Johnson later went on to win 2 Super Bowls with the Dallas Cowboys. Following Johnson were Dennis Erickson, Butch Davis, and Larry Coker. Miami won 3 more National titles and put more high round draft picks into the NFL from 1980 until the present than any other team. 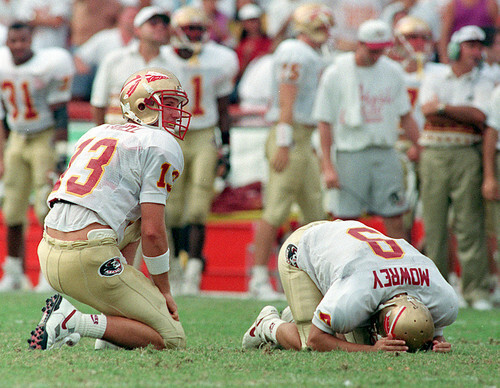 Today, the ‘Canes and ‘Noles do not resemble the teams from the glory years. For me, thoughts of these teams evoke memories of Ray Lewis, Deion Sanders, Warrick Dunn, Vinny Testaverde, Derrick Brooks, Warren Sapp and Chris Weinke. There were ridiculously fast and elusive offensive playmakers and speedy, bone-crushing defenses. You were afraid of these teams. Convicts and Criminoles were funny names but you actually took it seriously. Wide right, missed field goals by FSU kickers, became stuff of legend. So what happened? From my perspective, things began to change when Miami lost to Ohio State in the 2002 Fiesta Bowl game after an overtime phantom pass-interference call. When FSU lost a road game at Louisville in 2002, the ‘Noles seemed to lose their invincibility. It’s amazing how one game can change a program and push it into a different direction. That is what makes this sport so incredible. The minds of men age 18-24 is fragile and can be affected emotionally in so many ways. Programs are built and destroyed in the matter of weeks. Today, both Miami and FSU appear on the cusp of greatness. Elite players appear on both sides of the ball. Years of training and hard work are beginning to pay off and both teams feel they are ready to take the next step. Coached by Randy Shannon and Jimbo Fisher, the ‘Canes and ‘Noles are set to square off this Saturday. The winner could propel themselves into the National Title discussion for the next 10 years. The loser will have to answer questions that will linger over a lifetime. With recent powerhouse Florida rebuilding, the state of Florida is ripe for the taking. “The speed state” can make or break a program and on Saturday, someone may take hold of it and run away. Or maybe not. Will we see another edition of wide right? 3. Boise State 197 3 – 0 3 Beat Oregon St.
4. Oregon 195 3 – 0 4 Won @ Arizona St.
5. Nebraska 186 4 – 0 7 Beat South Dakota St.
11. Utah 126 4 – 0 13 Beat San Jose St.
18. Iowa 73 3 – 1 10 Beat Ball St.
19. USC 68 4 – 0 16 Won @ Washington St. 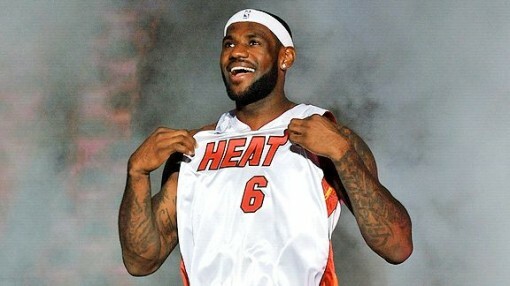 Anyone catch that article a couple of days ago on the most hated athletes in sports? I actually looked down the list and thought it did justice. The list was conducted by Q Scores Inc.
Here’s some of the top hated athletes. This is the actual order of the list that Q Scores Inc. put together. 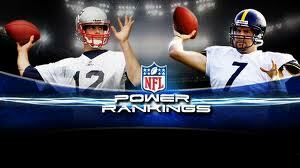 The only thing I thought when examining this list is that Tiger Woods and Michael Vick could possibly be switched. I know that Michael Vick had the whole spill with dog fighting (and did time in prison for it), but I felt that Tiger Woods would be the most hated because of all of his recent activity. Having such a high public status and cheating on his wife with all those different women would definitely cause him to public enemy #1. Regardless, they both have done things that the public disapproves of and frowns upon. Another one that I thought would be higher is LeBron James. It surprises me that Kobe is still above LeBron even though he’s been widely hated by many for years. In a matter of seconds, LeBron James went from fan favorite to probably THE most hated player in the NBA, after he had his “decision” announcement on ESPN back in July. It also didn’t help that he went to Miami along with his buddies, the other top free agents this off season, Dwayne Wade and Chris Bosh. 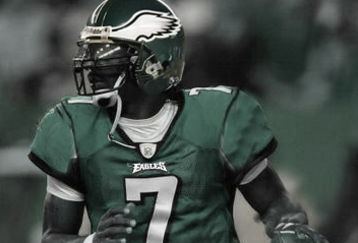 People thought he could lead a team to a championship himself but yet he opted out to join other players and try to win. I’d like to know what your guys list is. Here is my list consisting of picks off Q Scores Inc. These guys are, in my book (and many others I’m sure) the most hated. I WANNA SEE YOUR GUYS LIST!!!! Does Reggie Bush deserve to lose the Heisman? Remember that time period, from 2003-2005, when we saw USC’s dominance? Names like Leinart, Bush, White and Jarrett were heard every Saturday of every Fall? The amazing highlight reels that ESPN would air were the norm every week? Seems like those days are far behind us. Reggie Bush, perhaps the most widely-recognized of names from USC’s dominance during those years, has also been the center of such conflict and heartache for his alma mater that it is no surprise why many are looking to him as the scapegoat for everything that is going wrong for the Trojan football team. After much speculation that Bush was taking money and other gifts during his time at the University of Southern California, the NCAA conducted an investigation and discovered that Bush was ineligible because of such actions. As a result, USC now has to serve the following sanctions: 4 years probation, vacating the 2004 national championship title as well as all wins from the 2005 season. In addition, the Trojans are now banned from bowl games for the next 2 years and will lose 30 scholarships over the next 3 years–pretty severe penalties for one guy who accepted gifts from one Lloyd Lake, sports agent. 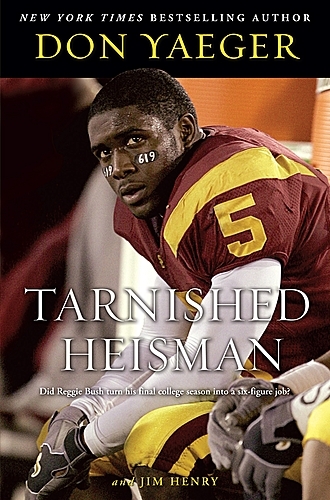 Perhaps the harshest of decisions came from USC to Reggie Bush: the removal of his Heisman trophy from the campus and removing his name from all Trojan record books. The harshest of these decisions, I feel, are those that affect Bush’s former USC teammates (two of whom are personal friends of mine): removing the 2004 and 2005 teams from the Trojan football record books. New Athletic Director, Pat Haden, made it clear that he was trying to clean up the program and do “damage control” since the university had suffered quite a bit. Then, on September 6, news broke that the Heisman Trust was prepared to take away Bush’s actual Heisman Trophy–the one that he owns. Being that the Heisman Trust and USC are two different entities, each have the right to decide what to do with objects they own and/or distribute. The Heisman Trust were balking at first to take the trophy away after USC decided to so, citing that it was USC’s right to do whatever they wanted to with the trophy, and it had nothing to do in deciding if the Trust was going to take Bush’s actual trophy away. While there have been reports stating that Heisman Trust representatives deny ever saying they were going to take away the trophy, and that it was a false report, it is my opinion that they are simply stalling on having to decide the inevitable. I feel that he should lose the Heisman trophy. Most people, like myself, say that he was amazing on the field and does deserve it; but the simple fact is he cheated and broke the NCAA’s rules. Being an amateur athlete, one should know how strict the rules are with the NCAA as well as know the consequences that may come if they violate those rules. Granted, the NCAA is harsh with its rules most of the time, they still have their standard on what they feel a student athlete is…even though it may be outdated. The rules that are in place you have to follow. I am not going to be naive and say that other schools are perfect in following the rules, it’s just a matter of who gets caught. All sports fans out there (especially our fellow moronz) aren’t naive to the idea that some of these athletes are receiving money and gifts on the side. I wouldn’t be surprised if he received gifts when he was recruited that continued on well into his stay at USC. If he in fact did, that’s another reason why he should return the trophy. It was these gifts that enticed him to go to USC (along with other great recruits) and be the top team in the country. It was also these gifts that brought him to play with the best athletes in the country which, therefore, allowed him the opportunity to accomplish all that he did on the field. I will admit, though, it was him out there making those exciting plays; he was pivotal to those teams and their success; and he probably was the most important offensive player they had at the time. People can say that these kids wanted to go to beautiful Southern California, but I find it strange that one school was able to get so many 5-star recruits year-in and year-out, and do so at a fast pace. Pete Carroll came under investigation but left to the NFL before the heat really got to him. Honestly, just do a Google search on USC recruiting violations or practices and you’ll definitely find a lot of stories. People are probably thinking that I’m crazy for saying this but it’s my opinion and it’s looking like it’s going to happen anyways! Reggie Bush doesn’t deserve to keep his Heisman, especially when the entire 2004 and 2005 teams were punished. How is it fair that he gets to remain in the NCAA record books, yet all of teammates are removed because of a mistake that he made? In the end, people who were alive during that time period will remember what USC did. That will never be forgotten regardless of what happens in the record books. Reggie Bush was one of the most electrifying players ever to play college football; he just messed up, and tarnished his legacy along with that of USC Trojan Football. LOL…then again, I’m a hater, and don’t like USC. I’m glad they got everything that came in the end :-P!